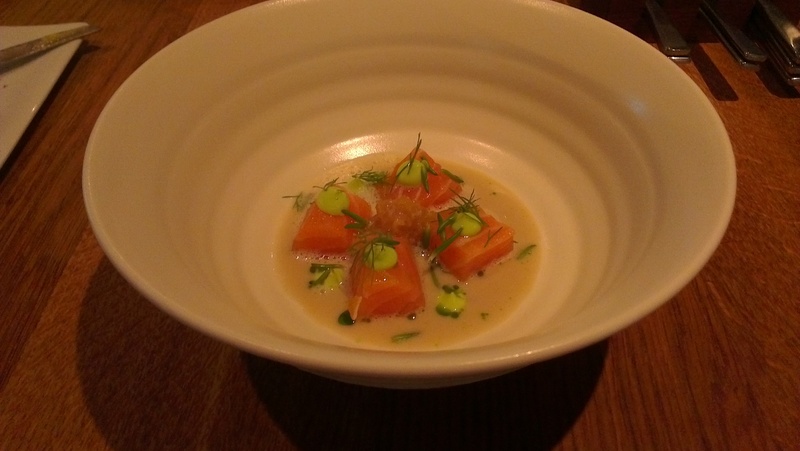 UPDATE 2014 – I’ve now eaten at Sat Bains on 6 occasions. Having eaten at many other 2* restaurants in the UK for me it is certainly up there amongst the best with its own style and vision. I have also, since writing the initial review, been lucky enough to enjoy stints at the chefs table and kitchen bench. You may prefer a quiet evening being waited on but if you want an evening to remember look no further than being amongst the action. Sat being in the kitchen is, for me, important. These are unique experiences where you get to see behind the scenes and chat to the chefs, and Sat himself. Mr Bains does not have a vast food empire and has not chosen to grow that way as other chefs have. He spends a lot of time in his kitchen and more widely is a great advocate for the region and Nottingham, which I admire. The food has been consistently strong on my visits and I have added some new pictures below to showcase. I am confident I’ll be back once again. 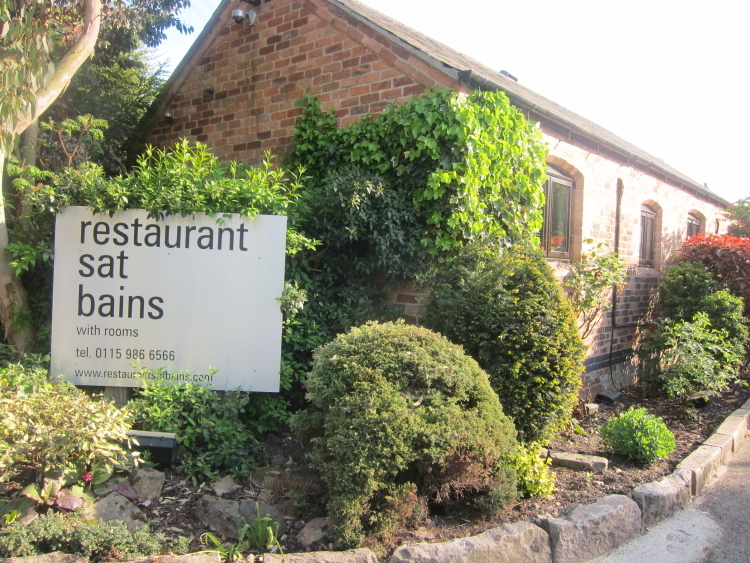 April 2013 – I first visited Sat Bains 3 years ago having never been to a Michelin starred establishment before; in fact I wasn’t overly familiar with the Michelin guide and it’s ratings. There are many food guides, reviews and rankings. The Michelin guide carries the biggest weight with (most) chefs, critics and reviewers. Gaining 1, 2 or 3 stars is the pinnacle of many careers, and the killer of others. Regardless of its criticisms and controversies, and there are many, it is still recognised as the ultimate prize to be in the little red book. Sat currently holds 2 stars and is one of less than 20 chefs in the country to do so. Back in Nottingham and by the end of this meal 3 years ago it was clear, I had caught the food bug. This restaurant therefore is a big part of the reason of why I write these words on this page, to share my passion and interest on not just my local eateries but some of the best restaurants in the country. Following my first visit I have now dined at Restaurant Sat Bains on 4 occasions, with a 5th visit imminent. Why here when there are so many other places? It may be that it is the romance with my first love, or it just might be that Mr Bains is a bloody good cook. Much has been said about the location of said restaurant, a reviewer once commenting “When the taxi driver took me down the deserted, unlit road to Sat Bains, I assumed it was to kill me”. It is certainly unusual when most Michelin starred enterprises are in swanky residencies in central London or great houses in the countryside. To me the surprising setting adds to its charm. The dining room also lacks the opulence of some of these grand competitors, but is comfortable, functional and stylish. As well as the main dining area the restaurant has introduced a chef’s table and kitchen bench if you want a closer look at the action. On arrival you are seated in a bar area for an aperitif and to a decision, which menu to have. 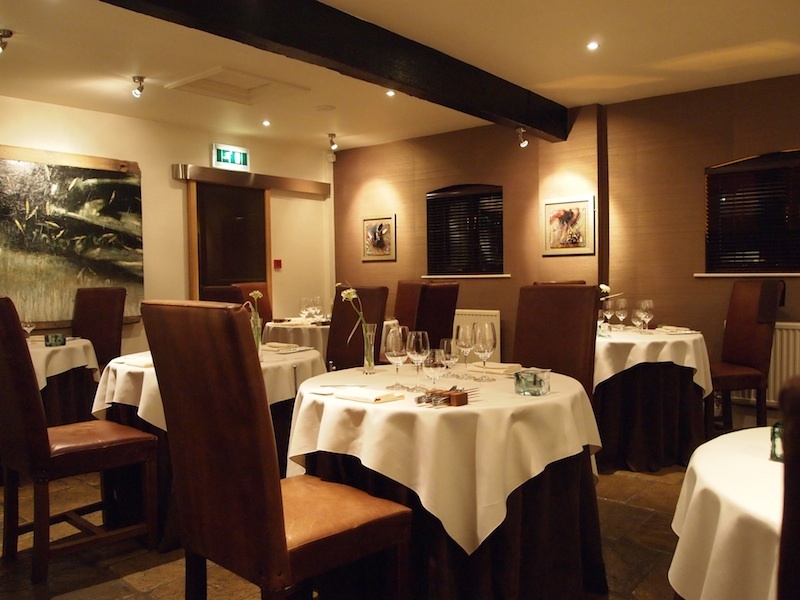 There is no a la carte option but two tasting menus; 7 or 10 courses. 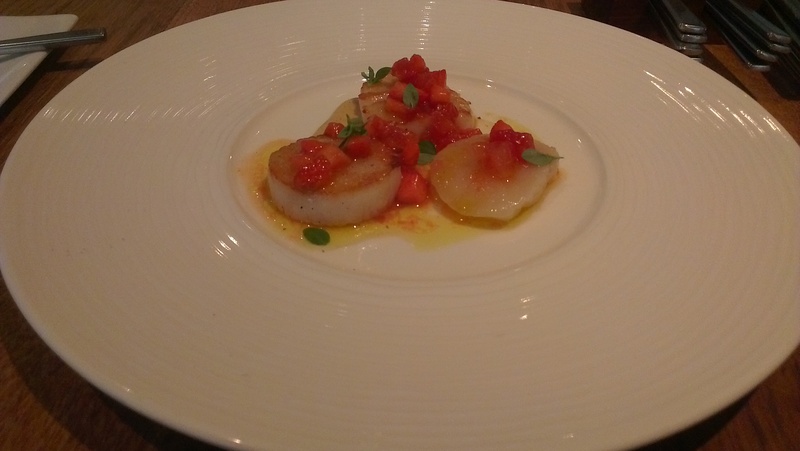 Priced at 79 and 89 pounds respectively it is comparable with other restaurants at this level outside of London. There are also two extra dishes you can add to either package for an extra £15. It would also be remiss not to comment on the wine here, the list is substantial and they also offer wine pairings matched to each course of the tasting menu. I had never fully appreciated the amount that wine could enhance food before I ate here, but the compliments between the wine and food really do add to the experience. Particularly with some unusual wines you would not find elsewhere, on this visit for example there was a Uruguayan red, sparkling sake and a 30 year fortified dessert wine. I will touch on those additional dishes I mentioned first. One of these is the longest running dish on the menu, and the one for which Sat would have come to most people’s attention. 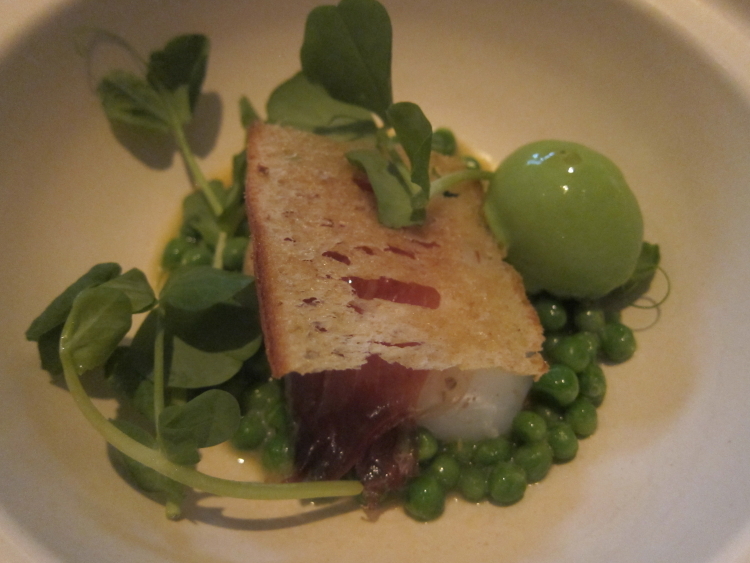 Ham, egg and peas was first seen on the second series of the Great British menu, scoring 3 perfect 10s from judges. 6 years after that competition it is hard to argue with that judgement. 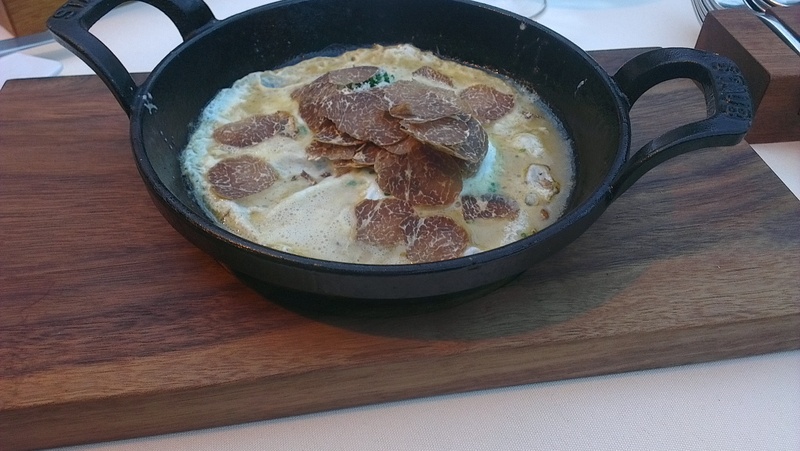 A new addition at my most recent meal was a fried pheasant egg with truffles, Michelin starred comfort food, and very liberal with the luxury ingredient. I won’t go through the 40+ courses I have now had here, but will touch on some highlights. Whilst some very technical gastronomy is employed the biggest innovation is the flavour combinations. 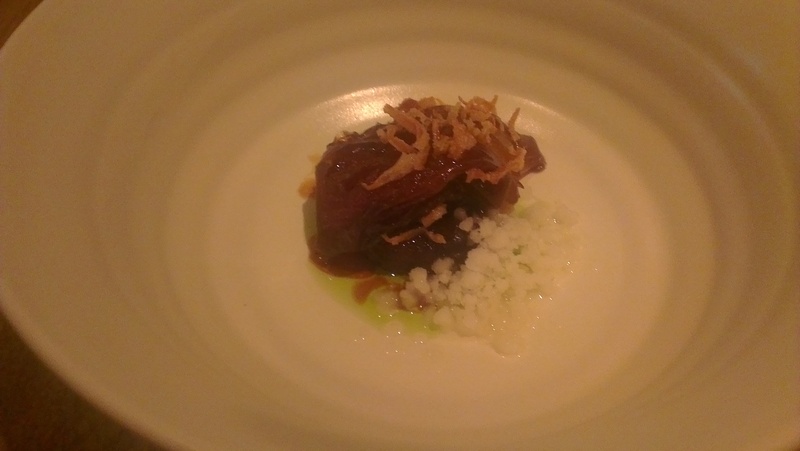 One of my most memorable dishes was duck paired with melon, feta, mint, chocolate and grapefruit. It takes a talented chef to marry and balance those ingredients, and it was done to perfection. 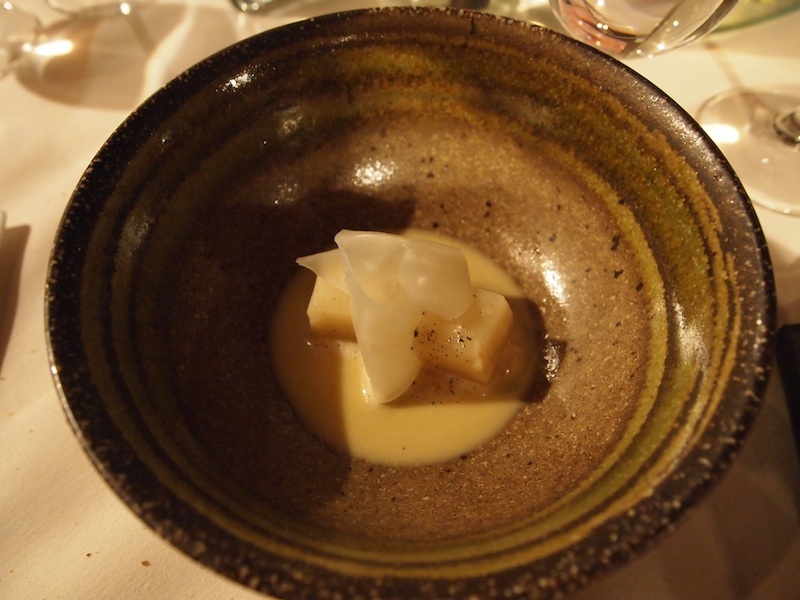 Another of my favourite dishes is a complete parallel and shows off a different skill, salt baked celeriac with chicken jus, is simple yet powerful. Of course not every course can be a unanimous hit, but that is more to do with the personal palate. A recent example was a pearl barley dish not favoured by myself but a friend’s favourite, there is something for everyone. I appreciate that this sort of food might not be for everyone, it is different, experimental and of course costly. To me that cost is immaterial, considering the vision, development and preparation that goes into every dish it seems a small price to pay. Tasting menus too divide opinion, the lack of choice frightens some people, people who like their steak well done and are cautious about the unknown of new ingredients. One of the great joys for me of this format is that your favourite dishes can end up being unexpected and something that you would never have chosen. I have now eaten at several places at this level and whilst I have sometimes had more consistent experiences nowhere has equalled the dizzy heights of the food here. If you are in Nottingham and looking for something special, you don’t have to go far. It is right on your doorstep. Very interesting article and I think you have won me over enough to give St Bains a whirl. I was previously put off visiting this restaurant because I had heard from 2 friends independently that the service was terrible. One comment one friend made was the staff treated him as if he was privileged to be allowed to eat there rather than it being a privilege for them to him as their customer. Abrupt staff but excellent food and wine (the former tarnishing the latter to the degree that they will never visit again). I still think I will take the time to visit and make my own judgement of the place, especially since you seem to rate the service very highly (it would be interested to hear why you gave 10’s all through but deducted .5 for the service? ).